Every month during the 'off season' (some of the guys have no off season, but for us regular guys, the off season is November through March, give or take a month on either end), Chris Wasta hosts a fly tying morning (9am to noon) at his wood shop located at: 1468 Old Stage Road, Decorah. All skill levels are welcome. In addition to that, most regular meetings include a fly tying demonstration from a club member. Pictures and recipes from past demonstrations are included below. Please note: all photographs on this page, and those linked to it, © 2008, 2009, 2010, 2011, 2012, 2013, 2014 by Marv Slind. Non-commercial use is permitted, provided appropriate credit accompanies the photographs. All commercial use is prohibited, except with the express written permission of Marv Slind. This fly is normally tied with black rabbit strips. Different color combinations can be used to match conditions. They can be doctored up with flash or rubber legs. I normally use it dead drifted behind a nymph or egg pattern or swing it as a streamer or slow retrieved through deeper pools. It has worked for me on both cold and warm water species. A simple and effective fly to use. Good luck. You could also wrap some dubbing in and cover it up with the tan thread to speed up the process as it is a number of layers of thread to get the right thickness. This started out as a winter only fly for me. I would fish it behind a small copper john or pheasant tail with great results. This last year I never took it off and fished it in all 12 months. The name NARly is derived from some old college slang with my last name of KleckNAR. 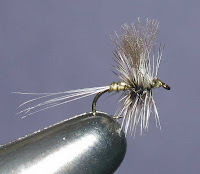 Having discovered the bug and perfected the tie with my college buddy Monte, I thought this was an appropriate name for the fly. This pattern is a combination of materials that are proven and basic to the craft. Primarily it mimics a caddis emerger, but also is effective any time. Why? Because you are using it and have confidence in it and trout are not very bright. Step 1) Attach bead of choice. I prefer tungsten in nickel. Hook size 12-18. I usually use 14 or 16. Step 2.) Attach small or medium diameter chenille in preferred color. First cut several two inch pieces and singe the ends with flame. Easy does it. Then cut those in two and you have lots of one inch pieces to work with. The length the chenille extends past the bend is entirely up to you. If quite long your quarry might mistake it for a worm of some sort and eagerly eat it. If too short there won't be any wiggle, which is a "trigger". But, again, the trout will still try to eat it since there are the shiny bead, peacock and soft hackle "triggers". Step 3) Attach the non-singed end to the hook about in middle of shank. Add a little dubbing over the area of attachment and then wind peacock up close, but not too close, to the head. Run the thread through the peacock a couple times for strength. Step 4) Tie in and wind a suitable feather for making a soft hackle. 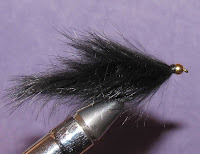 Hackle tips should not extend past point of chenille tie-in. Step 5) Attach two white goose biot feathers over the top of the fly and whip finish. BTW, In forty years of fishing I have never used head cement and maybe six or seven flies have come unwound. Just a waste of time and toxic fumes.